This Carrera Heritage watch is a testament to a long tradition of meticulous Swiss workmanship. Further, the fact that this stainless steel watch calls specific attention to heritage should not go unnoticed. For instance, the flinque effect on the watch’s dial could be considered a distinguishing feature of a proud chronographic legacy. 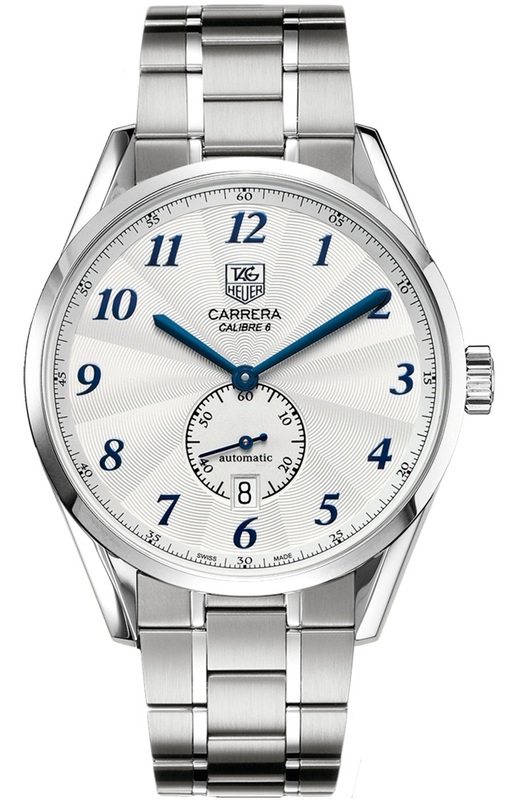 The dial’s unique texture is created according to an engraving process called “flinque.” The flinque effect for this particular Carrera Heritage is slightly wavy, which seems appropriate given the Mediterrean blue Arabic numerals that adorn its dial. The blue highlights on this automatic Calibre 6 watch provide an attractive contrast with its polished stainless steel bracelet strap. A smaller dial to count the seconds sits on the dial just above the numeral 6 and the Tag Heuer logo (also in deep blue) is stamped on the dial just below the 12. The bezel has been pushed back so that the watch face doesn’t look too cluttered and so that the contrast of color and texture can be fully appreciated. Pros: Double anti-reflective treatment on the scratch-resistant crystal covering the dial and water resistant to a depth of 100 meters (or approximately 300 feet). The dial also encompasses a smaller dial to count seconds which is positioned above the date window at 6. Possible cons: consumers should be aware that if they do not wear a mechanical self-winding watch for a while its power reserve will peter out after a couple of days. This means that the watch will need to be re-started by turning the crown (Tag Heuer suggests 30-40 times) until the watch’s movement is re-sprung and will start again. For watch connaiseurs, this will not come as a surprise, but people who are used to quartz movements (rather than the more traditional mechanical ones) may find this cumbersome. Luxury watches are made mostly according to tradition and are more often considered to be works of art than items that are designed to be 100% practical. For this reason, I would say that the price of this watch is worth it if you appreciate fine workmanship and artistry over a watch that will never need much maintenance. Finally, I would draw attention to this stainless steel Carrera’s counterpart, the Carrera Heritage WAS2140.FC8176 which boasts the same flinque effect dial, clear watch face, and Arabic numerals, yet is a different color scheme—an attractive gold and brown. Although the WAS2140.FC8176 has a leather strap rather than a stainless steel one, these timepieces seem to belong together. I would like to send a brochure in regards to our photo editing services, to whom can I possibly send it? Looking forward to your reply. Nice review, I own this watch as well. The only things I would add are that the blue hands and markers against the textured white dial make kt very easy to read. The case size at 39mm wears comfortably, but the dial with thin bezel is visually closer to 40 to 42mm watchs. It’s an elegant casual watch makes a nice daily wearer but is striking enough for dress wear.